Back when I was pregnant with Teddy Bear and didn’t know it, I received the most incredible gift: my great-grandmother’s canning book from 1942. I knew that my aunt would be sending it to me and I was so excited to forge a relationship with the great-grandmother I never knew by following the same recipes that she had used so many years ago. What is even more wonderful about this gift is that each generation since the original purchase has followed this book. I have a direct line to the women who came before me through this book. For me, that is powerful. Those are some powerful words! In ALL my life I have never come across such a powerful message about the need for the primary caregiver to assure the health of the family. This book frames good nutrition akin to NATIONAL SECURITY. Essentially, “if you don’t feed your family well, they will be weak and the commies will take over.” That last sentence makes me laugh, but I can see how that would make sense. If the North Koreans do decide to invade, I want to be full of kale and quinoa and not Kraft Macaroni and Cheese. As humorous as I may be (*wink*), I am especially interested in the idea that personal good nutrition is a benefit to the entire nation. That’s a BIG idea. Today, we hear a wide variety of messages in regard to nutrition that speak almost completely to the individual: “Don’t over-eat because you will be fat and drastically shorten your lifespan.” That is an oversimplification, but you get my drift. I can honestly say that I have not heard one PSA that focuses on your individual nutrition affecting the well-being of the broader nation. That may seem far-fetched, but think of it this way: if I have good nutrition that results in good health, I am able to care for my family well and have energy and vigor left over to volunteer in my community, thus caring for my nation at large. The message is different than those during WWII, but the IDEA is still the same. 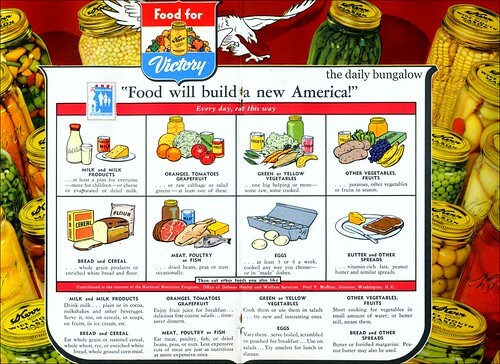 So, is the proper nutrition of my family my “sacred duty as an American woman”? Hell yes! I am 100% responsible for the food that enters the bodies of each and every member of this household. I do all the grocery shopping and all the cooking so if proper nutrition is anyone’s duty in this household, it’s mine. I don’t know how many people think of feeding their family in that light, but all of us who are the primary caregivers need to stop and take stock of our understanding of our role in the health of our families. Though the words are different, you can find this message in the movements of urban farmers, survivalists, homesteaders, community gardeners, and those just learning to garden and to preserve food. There is something incredible about being part of your food from seed to table. This is the HEART of good nutrition. We all lose when there is no connection to nature that fuels our bodies, minds, and spirits. We might be seven decades removed from this message, but we still can “Dig for Victory.” Maybe our digging won’t help to end a war, but it will help to provide a healthy future for our children and ourselves. Today our government is stressing Food Production and Food Conservation as the patriotic duty of every American citizen. “Plant a Garden” has become a nation-wide slogan, and with it is associated a larger HOME CANNING program. Protect your family’s health with filled shelves of home-canned fruits, vegetables, and meats – – – your assurance for healthful, nourishing, year ’round meals. YOU CAN HELP in this vast Victory program – – – plant, can and eat – – – this is your part! I actually just started following that blog, too! She liked my blog hop post, so I checked her out and gave a follow 🙂 I haven’t had a chance to poke around yet, though. I should do that so I can link to some of her stuff. I’m so excited about you sharing your wisdom and insight! I probably have more insight than wisdom 🙂 Haha. It will be fun to work on posts that require facts rather than just my own thoughts. I absolutely agree! That I am responsible for the healthy foods my family eat and that it can and will affect the others on a potentially global scale. It always starts with one and expands. Not only from a collective conscious standpoint but by living healthy, we feel better, behave better and in some way, that better-ness may help us to get along and cooperate more effectively and the snow ball effect goes on in the right direction. A bunch of over-sugared kids will not grow up learning well, behaving well or later on, leading well. “Better-ness.” Literary gold! There is so much truth in our future generations being affected by their nutrition. The biological implications are astounding enough without adding the social ones in, too.